I first read The Handmaid’s Tale in high school at the suggestion of my favorite English teacher. I decided to reread it now because of all the hype surrounding the release of the Hulu adaptation, which I was dying to be a part of even as I wasn’t sure I could handle watching everything that I knew was going to happen happen to an actual woman before my eyes, even if said woman was an actress playing a part. I have to be careful what I let into this brain of mine, as she is very visual and also prone to existential crises. Listening to the audio version proved to be the perfect compromise, as it still felt like a performance but without the visual punch I’m sure the Hulu series entails. Claire Danes’s narration is absolutely stunning, one of the best audio book performances I’ve ever heard. If you aren’t convinced of her acting ability already, you will be after listening to this book. Her interpretation of Offred is beautifully understated, almost deadpan at times, which captures the exact tone I think Atwood was going for. (She is the queen of dry wit, after all.) But then, suddenly, she brings an edge to her voice that reminds you how deeply angry she is about her situation and what her life has become. I get shivers just thinking about it. I was a little hesitant to try this in audio because I sometimes have trouble following dense prose in that format, but I was sucked in from the first moment and had no trouble hanging with it. I would find myself wishing my work day would go faster so I could get in the car and listen some more as I drove home. Normally, my brain is too fried after work for audio books and I have to switch to music or podcasts, but with The Handmaid’s Tale I was always eager to get back into the story. I wish I knew how much credit for that is due to Atwood’s writing and how much to Danes’s interpretation. 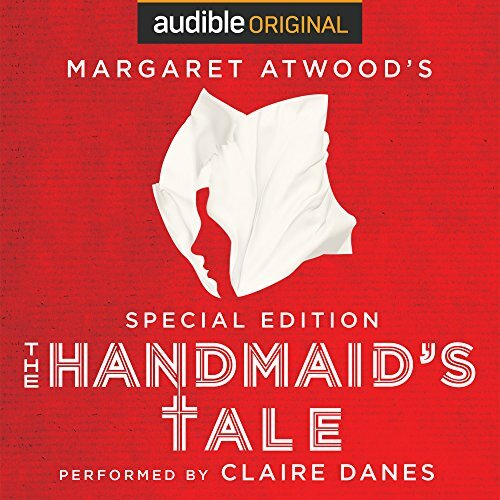 Another perk to the just-released audio “special edition” is the extended ending, added this year by Atwood herself. I don’t know that it changes much substance-wise, but for die-hard fans it’s a neat addition, and some have even speculated that it hints at a sequel. (!) Personally, I wouldn’t put anything past ol’ Mags. She is clearly as ornery and active as ever (seriously, read some of the interviews she’s given lately).